Diagram 2: Mechanical extraction of palm kernel oil. A swinging hammer grinder, breaker rolls or a combination of both then breaks the kernels into small fragments. This process increases the surface area of the kernels, thus facilitating flaking. 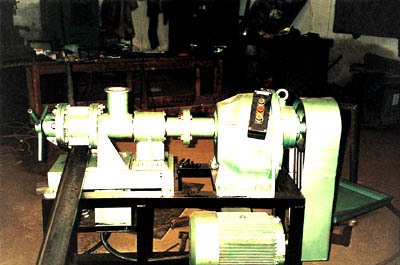 The kernel fragments subsequently are subjected to flaking in a roller mill. A large roller mill can consist of up to five rollers mounted vertically above one another, each revolving at 200-300 rpm. The thickness of kernel cakes is progressively reduced as it travels from the top roller to the bottom. This progressive rolling initiates rupturing of cell walls. The flakes that leave the bottom nip are from 0.25 to 0.4 mm thick. · coagulate the protein in the meal to facilitate separation of the oil from protein materials. The expelled oil invariably contains a certain quantity of fines and foots that need to be removed. The oil from the presses is drained to a reservoir. It is then either pumped to a decanter or revolving coarse screen to remove a large part of the solid impurities. The oil is then pumped to a filter press to remove the remaining solids and fines in order to produce clear oil prior to storage. The cakes discharged from the presses are conveyed for bagging or bulk storage. 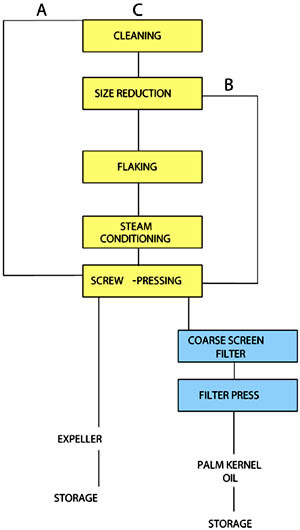 As can be seen from Diagram 2, not all crushers use the same procedure for mechanical extraction of kernel oil. There are three variations: direct screw-pressing, partial pre-treatment, and complete pre-treatment. The full pre-treatment processes described earlier are carried out prior to screw-pressing. Plants with larger capacities (50-500 tonnes per day) choose complete pre-treatment and the equipment is usually imported from Europe. FATECO and Faith Engineering now offer the complete line for small-scale operators. Palm kernel extraction is a specialised operation undertaken by a completely different set of processors. They are usually better organized as a group and are not as dispersed as palm oil processors. The kernel processors have to go around the palm oil processors during the peak season, when prices are lowest, to purchase the nuts for drying. 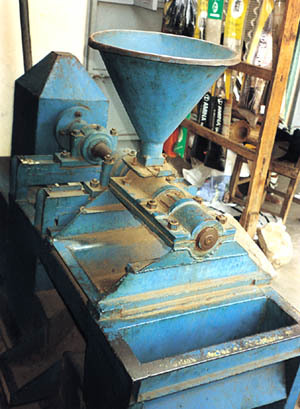 The nut processing and oil extraction is undertaken in the dry season when the pressure to obtain raw materials has subsided. The traditional palm oil processing starts with the shelling of the palm nuts. The shelling used to be performed using two stones to crack each nut and separating the kernel and shell simultaneously. This manual operation has been largely superseded by the use of nut-cracking stations. The mechanical nut-crackers deliver a mixture of kernels and shells that must be separated. The kernel/shell separation is usually performed in a clay-bath, which is a concentrated viscous mixture of clay and water. The density of the clay-bath is such that the shells sink while the lighter kernels float to the top of the mixture. The floating kernels are scooped in baskets, washed with clean water and dried. Periodically, the shells are scooped out of the bath and discarded. The traditional oil extraction method is to fry palm kernels in old oil or simply heat the dried nuts. The fried kernels are then pounded or ground to a paste in a motorised grinder. The paste is mixed with a small quantity of water and heated to release the palm kernel oil. The released oil is periodically skimmed from the top.